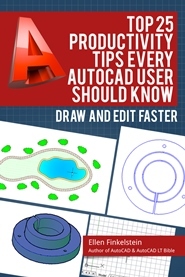 There are several ways you can let AutoCAD do some quick arithmetic for you when you need a distance. 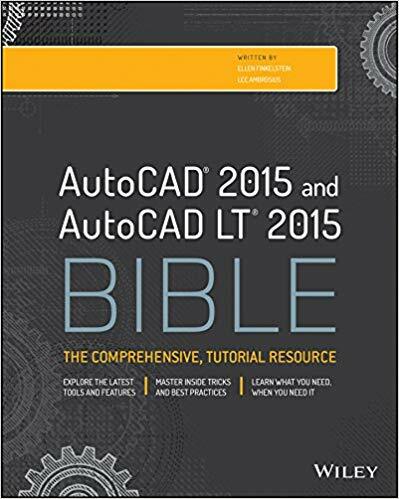 Let’s say you’re drawing a line and you want to use direct distance entry to specify the length. What you know is that that line should be 4.372 plus 3.925. Of course, you could use a hand calculator or (gasp!) take out a pencil and paper and do the math. Start with a left parenthesis. Next comes the operator, such as. + – * or /. At the Specify next point or [Undo]: prompt, enter ‘cal and press Enter. At the >>>> Expression: prompt, simply enter 4.372 + 3.925 and press Enter. Did you know that you can enter expressions in dialog boxes and the Properties palette? Just type the expression, such as 4.372+3.925 and press Alt-Enter (don’t forget to press the Alt key!) You may have to press Enter to complete the change. 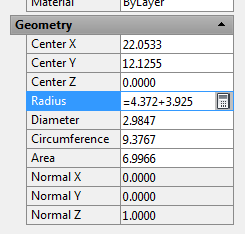 For example, you can use this method to change the radius of a circle in the Properties palette. For this to work, the CALCINPUT system variable must be set at 1, which is the default setting. Okay, I get this. Been using NN00/254 to enter centimeters as inches for years, where NN is the distance in cm. As long as the numerator and denominator are integers, this works practically everywhere. I get using ‘cal as well – if all you want is the value. But how can I use an expression when trying to enter line line segment by bearing? I very often work with drawings using decimal feet. I want to convert to inches as I go by simply multiplying by 12. But how can this be done when trying to draw a line segment by distance@bearing, i.e. 144<S45D0'0"E? Switch to Bentley Microstation. They’ve been able to do this from any key-in field for about 20 years.